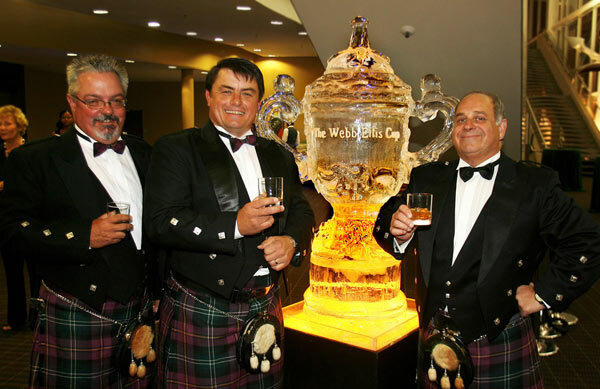 Ice Art was commission by the Chris Burger Petro Jackson Players Fund to carve an ice sculpture replica of the Webb Ellis World Cup Rugby Trophy for the BELL’S Night of the Stars Rugby Extravaganza at the Durban ICC. The function was very well attended from the greats of the past in Joel Stransky and Bob Skinstad through to the entire Springbok team. The aim of the function was to raise funds for injured players, and their target of R 1 000 000.00 was reached with exceptional contributions coming from as far and wide as Morgan Freeman who pledged R 100 000 to the fund via a live feed to LA. 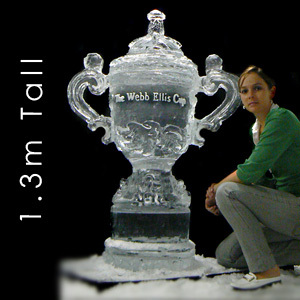 Ice Art was privileged to be a part of the function and produced this 1.3m tall, 350kg ice sculpture replica of the iconic trophy. 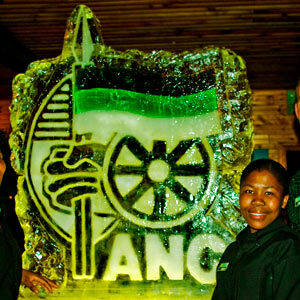 It was made up from three blocks each weighing 140kg, which were joined and then carved in our freezer in Cape Town and thereafter taken apart into 3 sections and re-assembled on site in Durban, at the ICC venue. 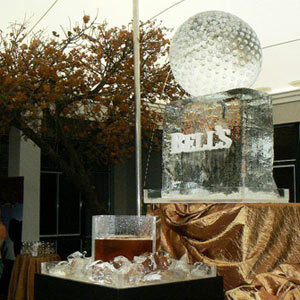 The feedback regarding the guest reaction to the ice sculpture from the client was excellent, “A huge hit!” and provided many guests with great photo opportunities. 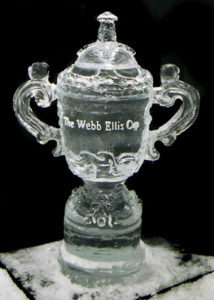 This ice sculpture was quite a tricky one as the supporting stem had to be strong enough to carry the weight of the hefty upper half of the trophy for the duration of the night. This was also a crucial joint point in the ice sculpture and so this join had re-align perfectly horizontal when re-assembled again. 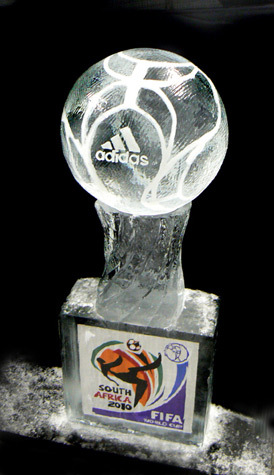 The trophy also has a high level of gold leaf detail which we managed to replicate very closely. We had to leave the ice making up the trophy handles a little thicker than the original as they needed to last for a good 7 hours and at the end of the function they were still looking the part. We are expecting the photos from the actual event soon and we will post them shortly. 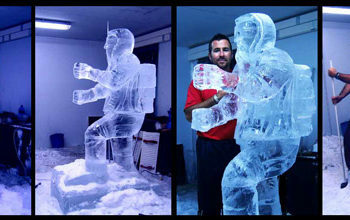 The pictures in the blog and website are taken from inside our freezer before it was disassembled. 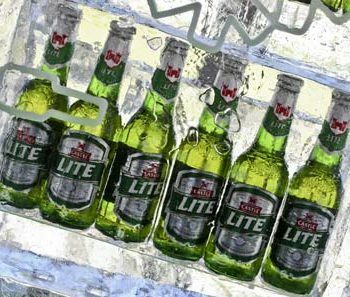 For more information please browse our website further and slo visit our Press Office which is also on our site. 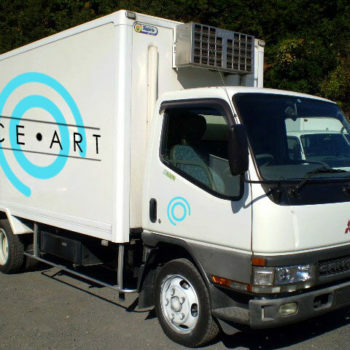 We can and will design and produce any ice sculptures that you can think of under the sun, from ice sculpture designs and logos, to wedding and party ice sculptures, ice bars, ice shooter luges and even live ice carvings.